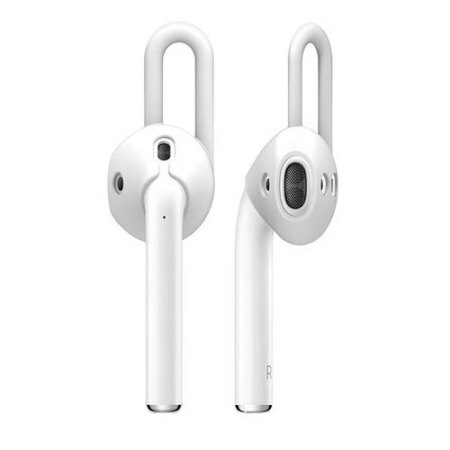 Designed exclusively for Apple AirPods, the Earhooks from Elago is an ideal accessory to ensure a secure fit and convenient storage of you wireless earphones. Each package comes with two pairs of Earhooks which are different in size. Designed exclusively for the official Apple AirPods, the Elago AirPod Earhooks is the perfect accessory to prevent your wireless earphones from falling out whilst playing sports, walking or just relaxing. It also serves as a protective layer which saves your wireless earphones from getting scratched, stained or dented. Note: Apple Wireless AirPods are not included. Due to being made out of non-toxic silicone material, the Elego Earhooks are super slim and lightweight. It will add little to no bulk or weight to your already feather-weight Apple AirPods. You will be receiving two different-sized pairs of Earhooks in each package, making sure you have an ability to pick one that suits you most. You can then keep the second pair as a backup, or share it with your friend. Storing your AirPods has just gotten easier - you can now hang your AirPods at a secure place minimizing the risk of getting them misplaced. The Elago AirPod Earhooks are fully compatible with the official Apple AirPods. Its smart design will not impede any of the AirPods features!